A while ago NASA confirmed that life on Mars could still be discovered but although NASA’s curiosity mars rover still scouring the surface of Mars no sign of life has yet to be found. Or may they have overlooked something? On the 1151 Martian day or SOL 1151 of the rover’s mission on Mars (November 2, 2015), the Curiosity captured something what seems to be an alien who stands in a gap of a big rock. 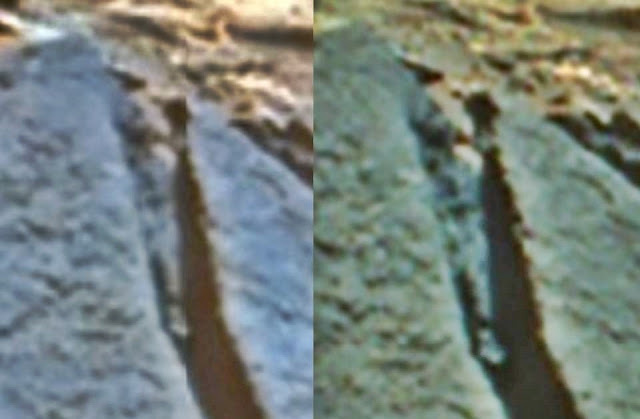 Although skeptics will say that this is just another case of pareidolia in the image a head, eyes, torso, arms and legs can clearly be distinguished. The head appears to be conical, like a bird head. Left leg/foot is sticking out while the left arm folded across the chest touching the elbow of the right arm. According to physicist Dr. John Brandenburg, who has published a study the Journal of Cosmology and Astroparticle Physics, suggesting that two races of beings, the Cydonians and the Utopians, were killed off in dual nuclear explosions that left Mars in the state we currently observe it today. 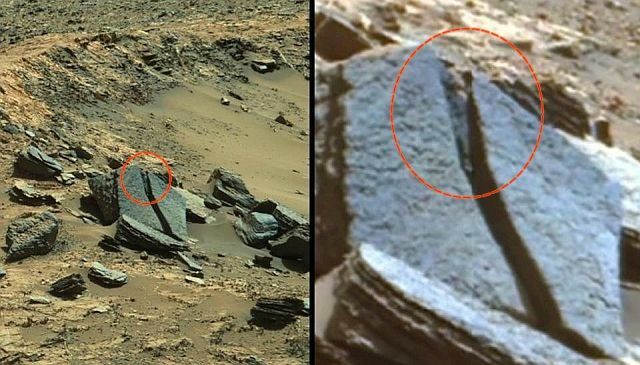 There is plenty of archaeological evidence of prior life on Mars and as crazy as it might sound, it’s quite possible that Mars still is inhabited by a form of strange life considering the being depicted in Curiosity’s intriguing image.